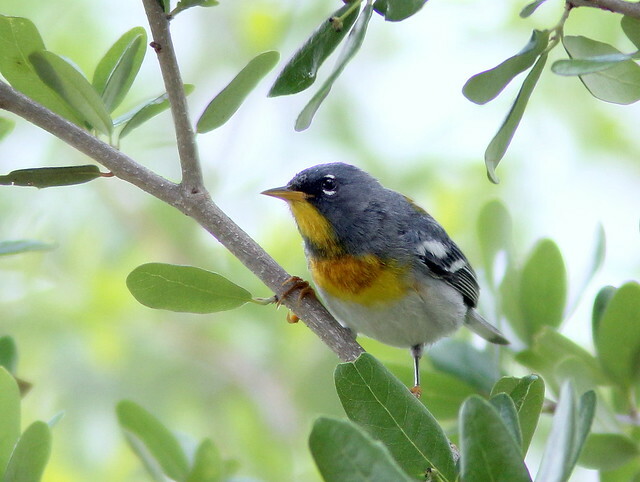 This spring, warbler migration was painfully dull both in our part of south Florida and near our second home in northeastern Illinois. 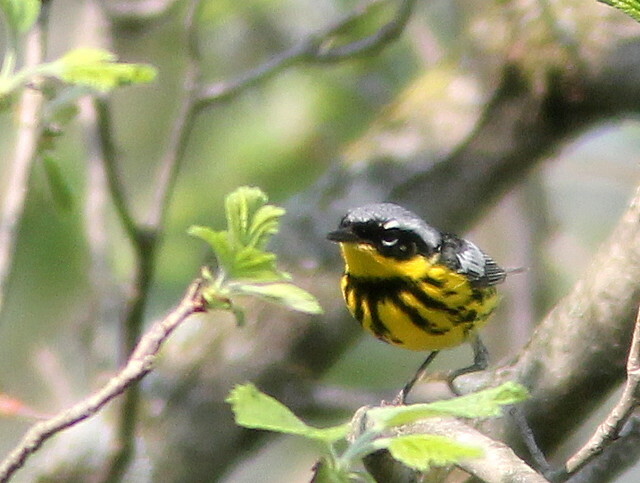 We departed for Illinois at the beginning of May, just when numbers of warblers had started building up there in previous years. 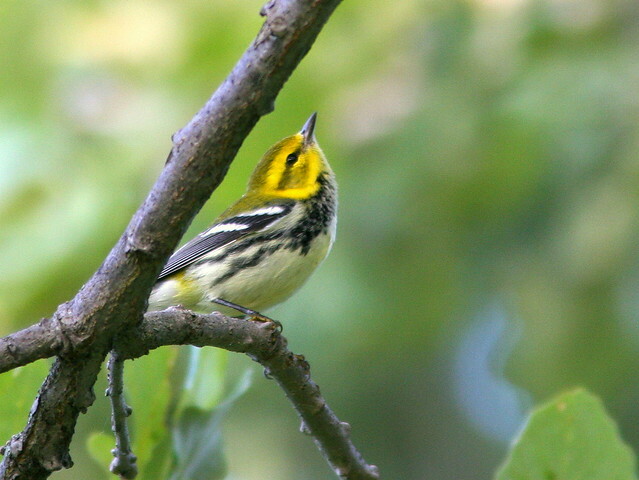 Now that summer has arrived and it is a rainy day, all I can do is remember last year and look forward to fall migration. 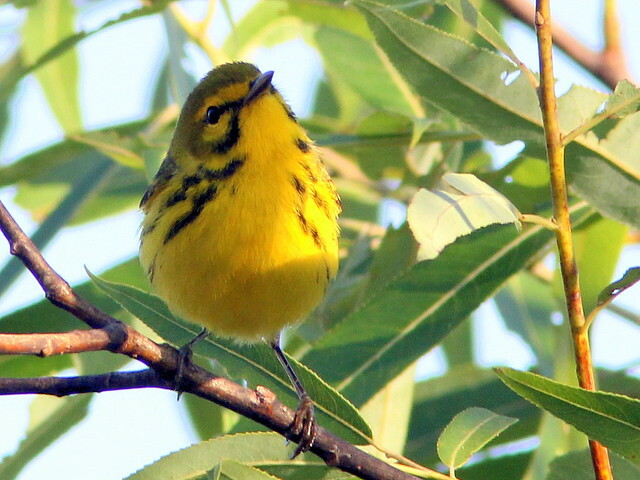 The Prairie Warbler was quite common in Florida this spring, but we have never yet seen one in Illinois. 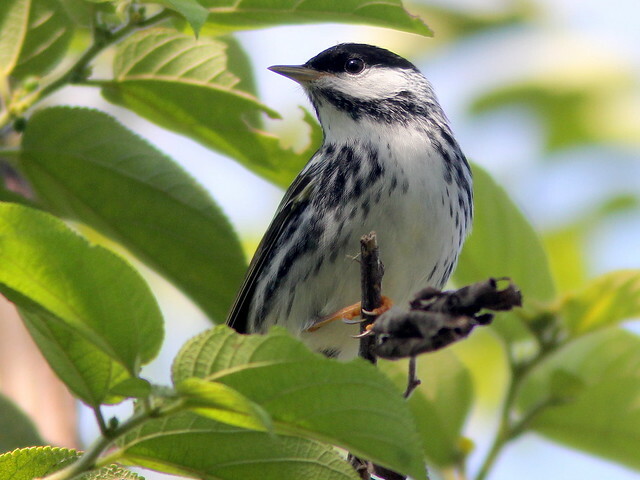 Now I’m remembering some warblers we had hoped to see– but didn’t see at all this spring, either in Florida or Illinois. 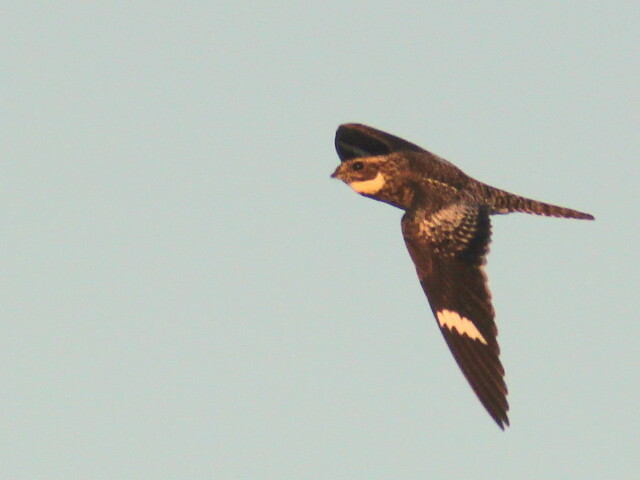 Nighthawks are masters of erratic flight. 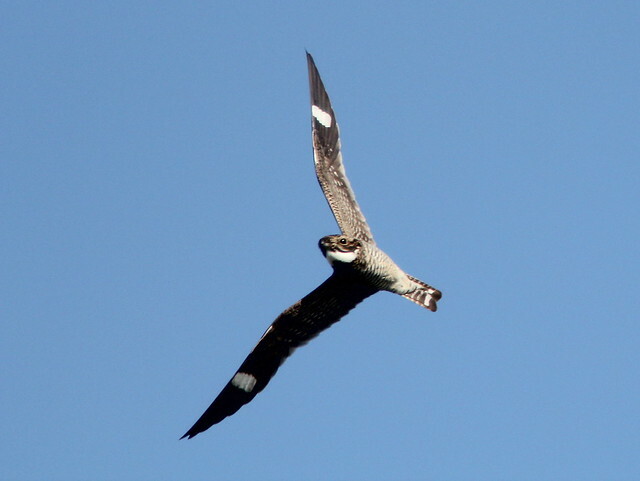 Their wing beats have no regular cadence, speeding up and slowing down, dipping and diving. Seeing a choice insect, they can make a right angle turn with no warning. Getting one in the camera viewfinder is a challenge, much less than keeping it there and depressing the shutter at the right instant. 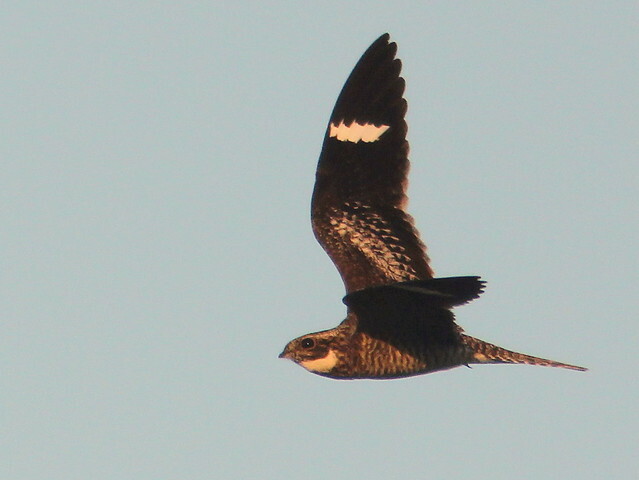 My flight shots of nighthawks are usually 90% sky and clouds, with perhaps a snippet of tail-feathers or wingtips. 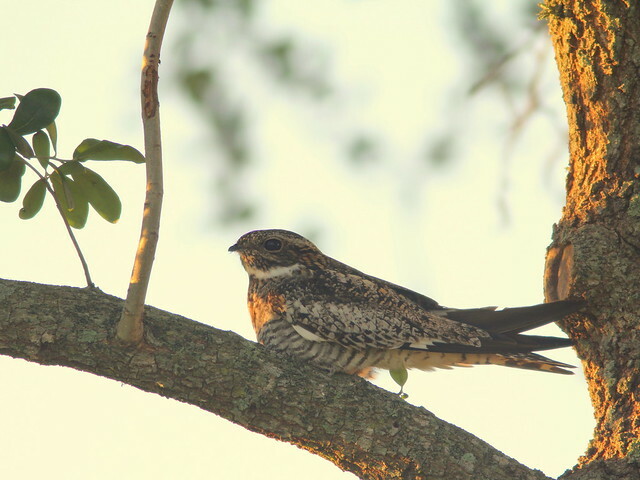 Since nighthawks are most active at the ends of the day, I am lucky when one banks to catch the rays of sunrise on a wing surface. 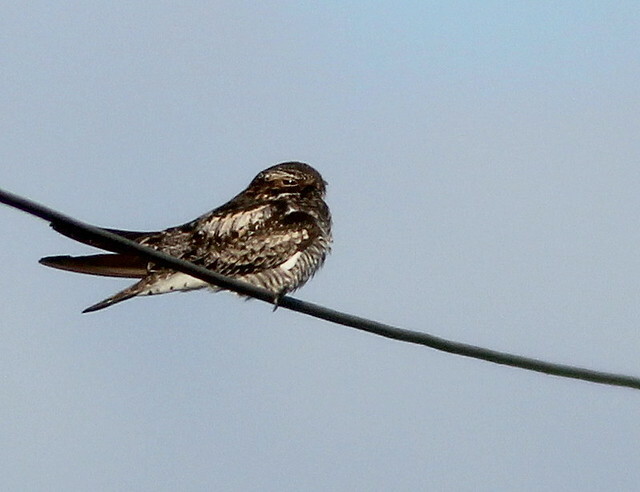 Nighthawks usually land on the ground, but may perch lengthwise along a branch or even a utility line. 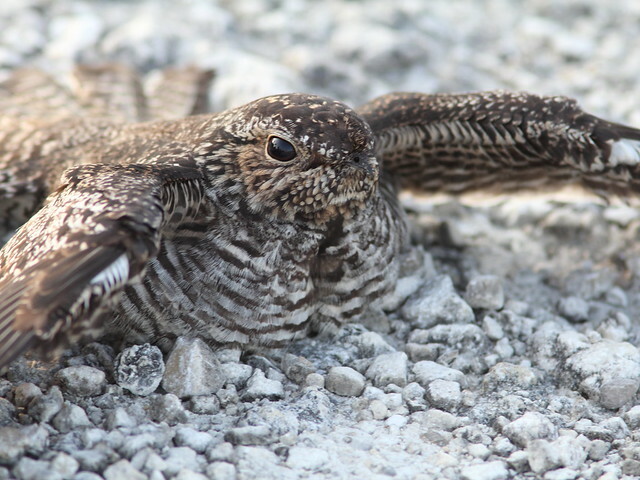 This past week, a few days before we returned to Illinois from Florida for the second time this year, we found the nest of a Common Nighthawk. 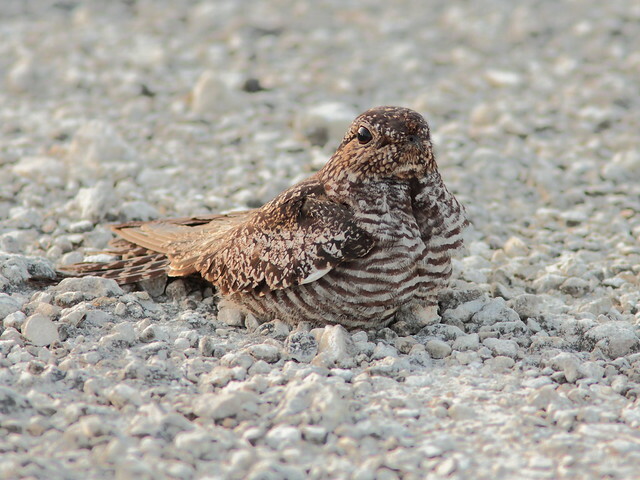 A nighthawk flew up some distance ahead of us as we walked along the edge of the gravel road that leads into our local wetlands patch. 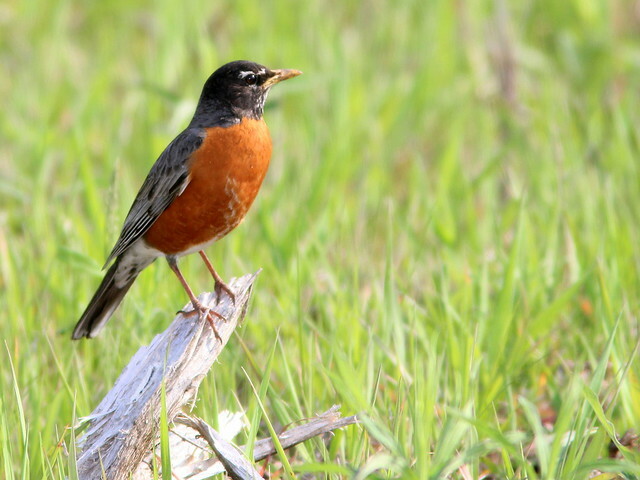 I fixed my eyes on the exact spot where it had been resting, and, standing back on the road several feet away, we methodically searched for its nest. Nighthawk eggs and chicks blend in perfectly with the pattern of pebbles and stones, and it would be very easy to step on them if we did not place each step very carefully. I found the nesting site (it cannot be called a “nest” as it had no visible structure) next to a small tuft of grass, quite dangerously near the tracks of deer, raccoons, bicycles and joggers. 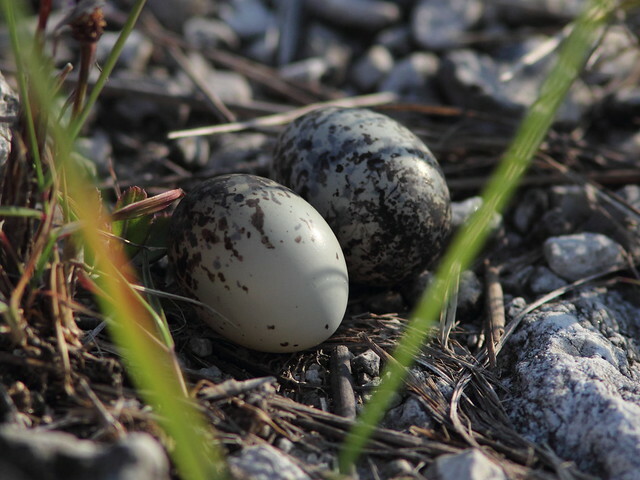 The eggs were set apart from each other, suggesting that the adult may have been shading them from the sun rather than incubating them. 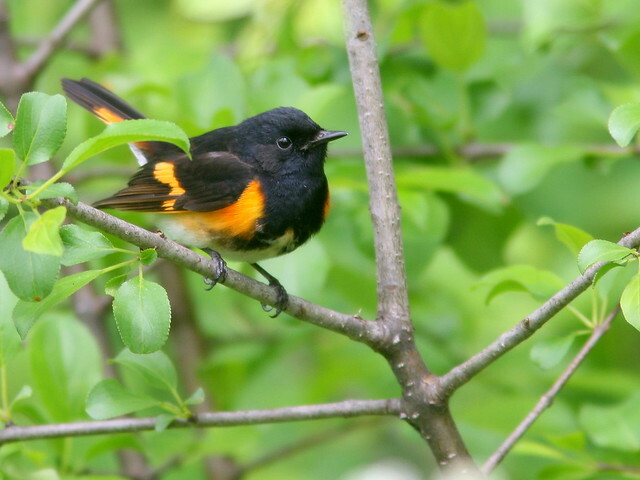 We retreated as the parent bird returned to shelter the eggs, and photographed her (or him, as both sexes take part in incubation) on the nest site. The next morning, Mary Lou was ahead of me as we walked along the gravel road. 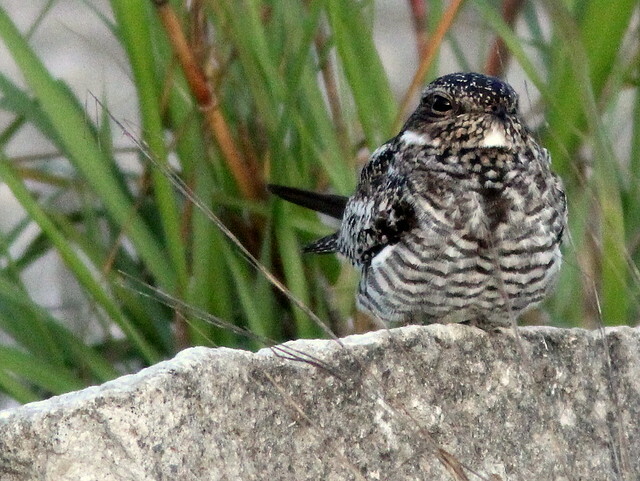 Suddenly she was startled when a nighthawk flew up right in front of her. It actually flew towards her, then fell to the ground, flopping and rolling as if in agony. 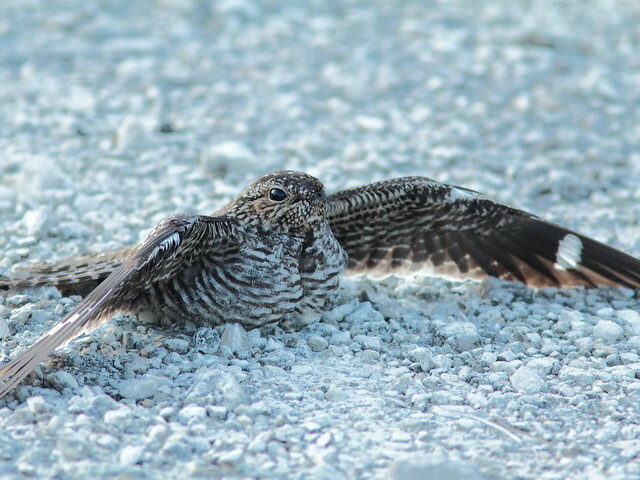 It was obviously performing a distraction display, and the amount of energy that went into it suggested that Mary Lou had nearly stepped on the eggs (or more likely young birds). 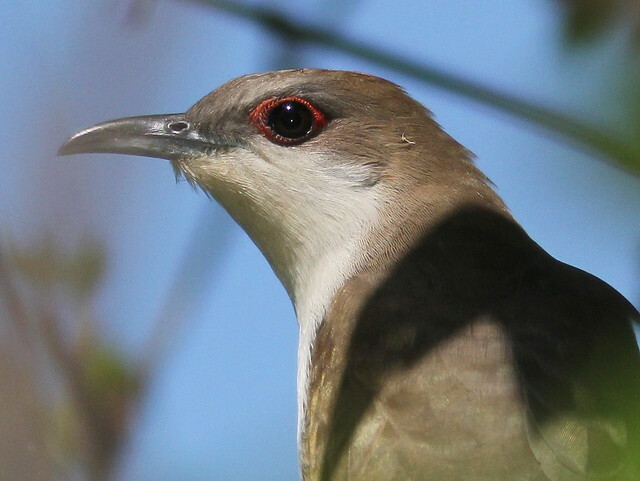 I had to set the camera on macro to get these shots, as the bird allowed a very close approach before moving away. 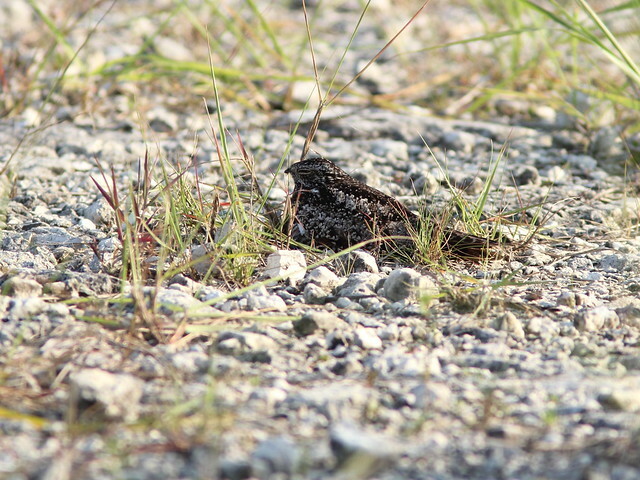 We briefly examined the area from a safe distance but did not see any eggs or young– not surprising, as they are well camouflaged. 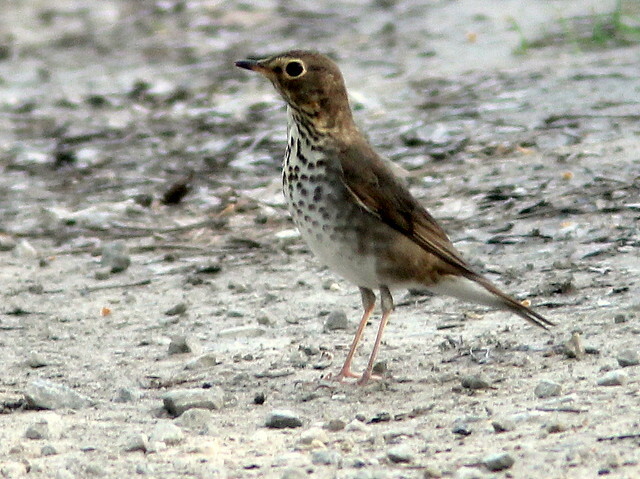 The bird was obviously under great stress, so we did not remain there very long. 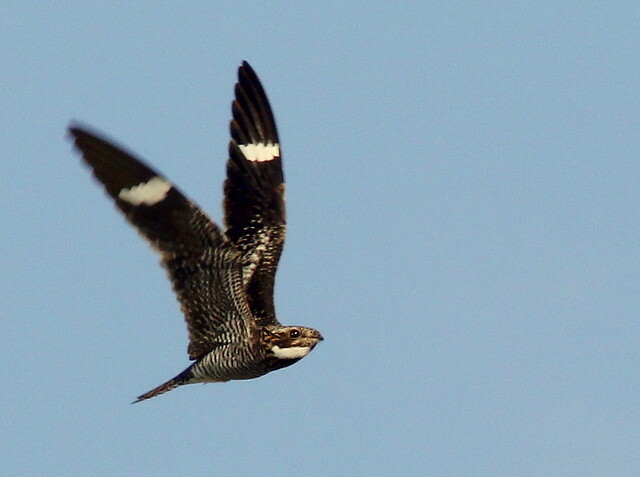 As we walked away it resumed a more normal posture and flew back to the nesting area. 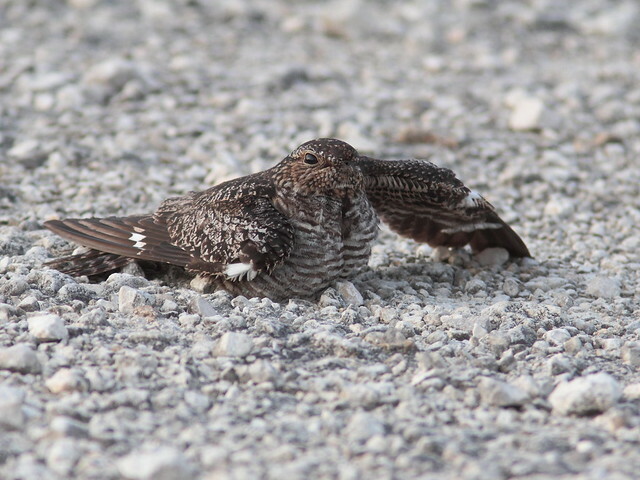 In the meantime, its mate had been flying back and forth on the opposite side of the road, issuing soft calls that sounded like “kwoo,” quite unlike the familiar loud and shrill “peent” that we often hear from flying nighthawks. Today’s photos are evidence that we have returned to Florida. We were greeted with rain almost every morning. This and the need to catch up on doctor and dentist visits curtailed our time in the field. However, we did not have to look very far to enjoy the bird life. A Great Blue Heron provided us with quite a show as it swallowed a very large exotic catfish. Hypostomus plecostomus, also known as Algae Eater or “Pleco,” is a popular aquarium fish from South America that has been introduced into Florida waters. They are not poisonous, though they do have sharp spines that could cause injury if they are handled carelessly. 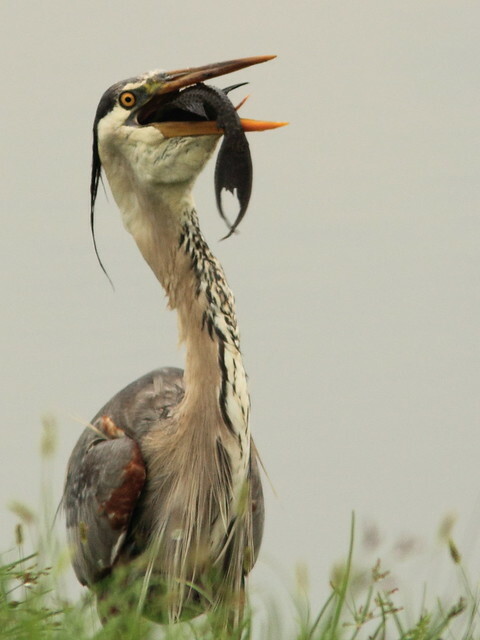 This is the second time I have photographed a Great Blue Heron eating one. Mary Lou spied this heron in the act of spearing its prey on our back yard lawn next to the lake. We do not know how long it had been since it was caught, but these photos span a period of eight minutes. 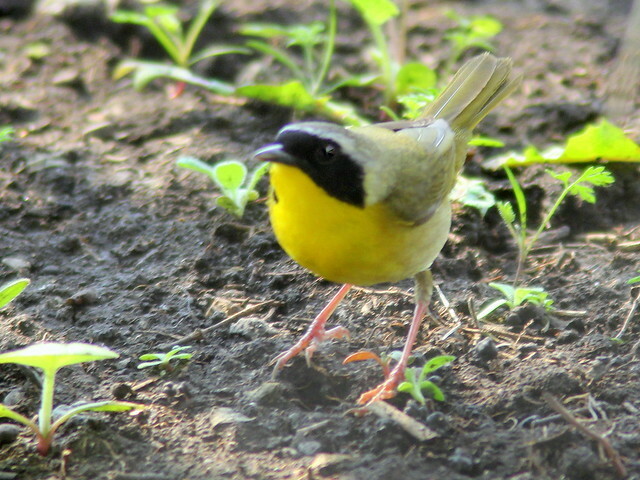 The photos are of poor quality, as I took them from inside the house through the glass of our rear door. 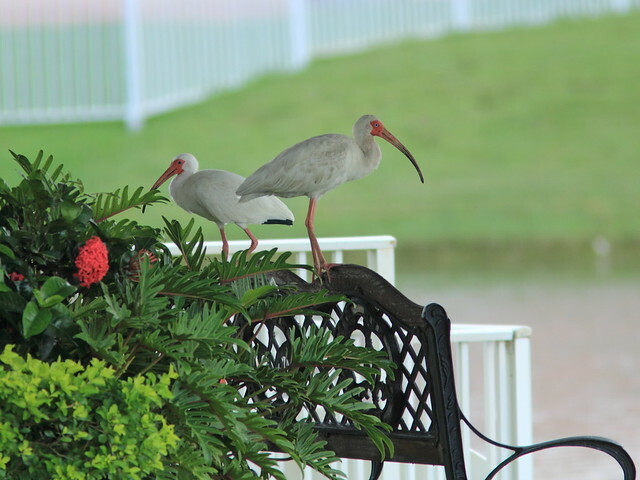 This has been a great year for White Ibises. 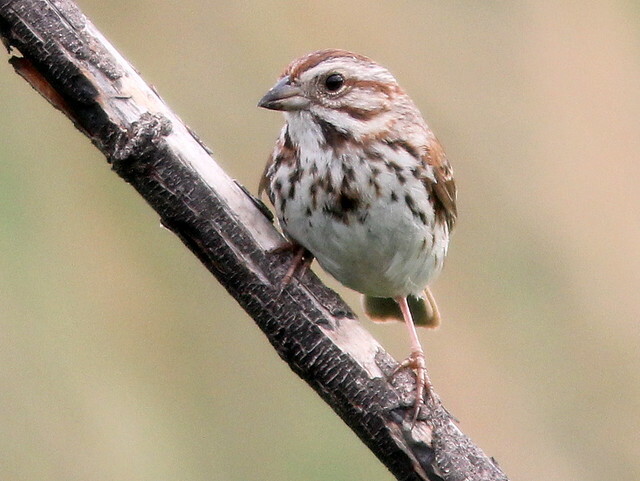 There are many immature birds with varying amounts of dark coloration. 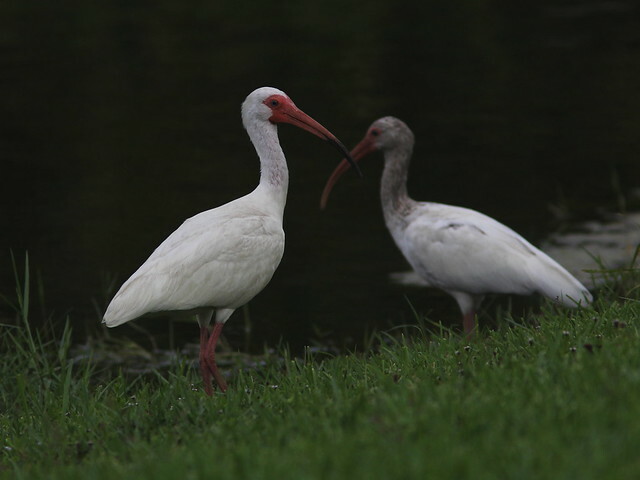 Some of the adult ibises seem to have a grayish or “dirty” cast to their feathers, probably stains from foraging in muddy puddles, of which there are many. These two were taking advantage of the shade in our next door neighbor’s back yard. 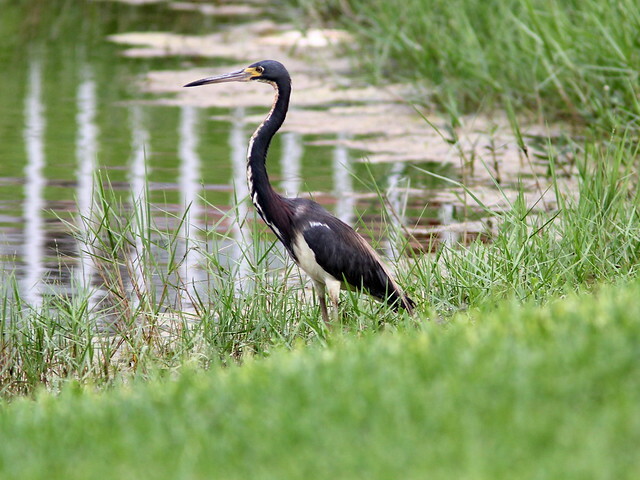 The profile of a Tricolored Heron stood out against the reflection from a neighbor’s fence. 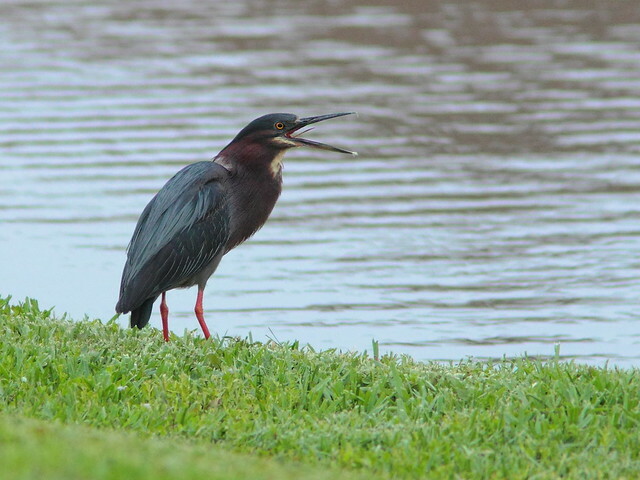 A Green Heron protested my attempt to move in closer for a better shot. Two Wood Storks have been foraging along the shore of our small lake. 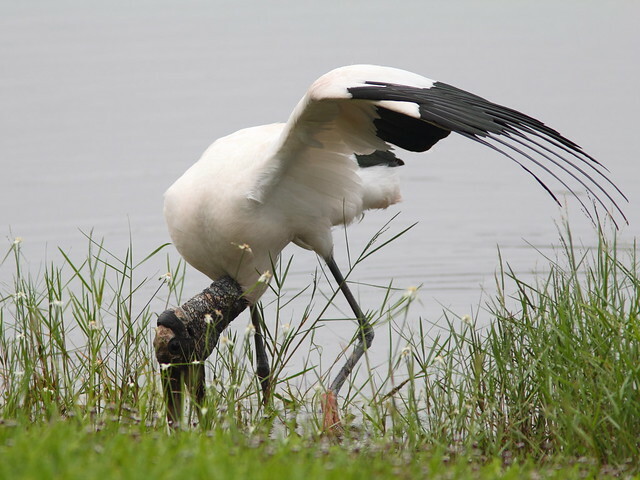 This Wood Stork moved nearer and stirred the water with its bubble-gum pink foot. 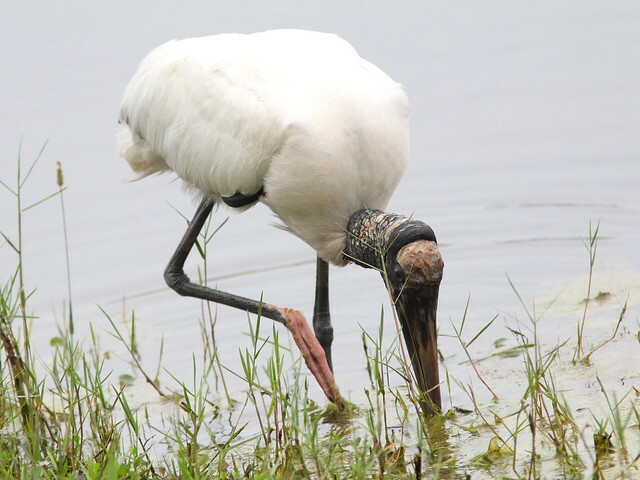 Since the banner year of 2009, we have seen few to no immature Wood Storks in our local lake. 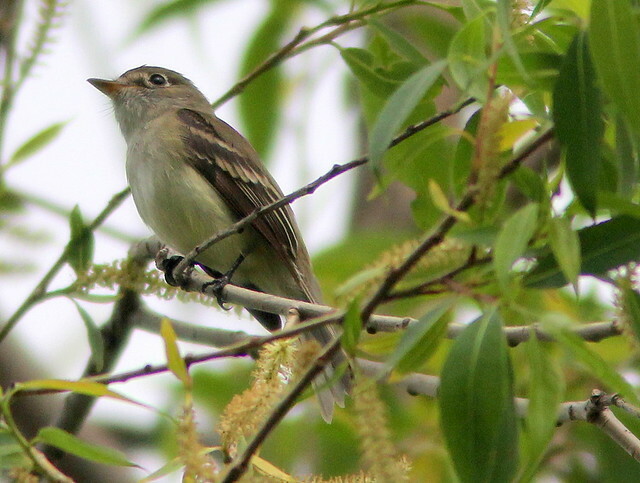 Although I do not know where these particular birds are nesting, this correlates with their failure to nest at all at Corkscrew Swamp during the past three seasons. 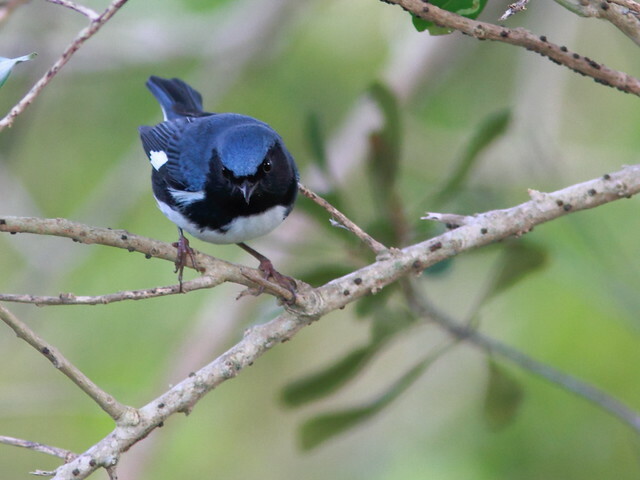 At Corkscrew, where they historically turned the rookery trees white during the breeding season, the census has shown no nesting pairs at all in 2007, 2010, 2011 and 2012. There were 1120 in 2009 and 600 in 2006. This spring I did see a few immature storks in Palm Beach County, where several pairs are nesting. 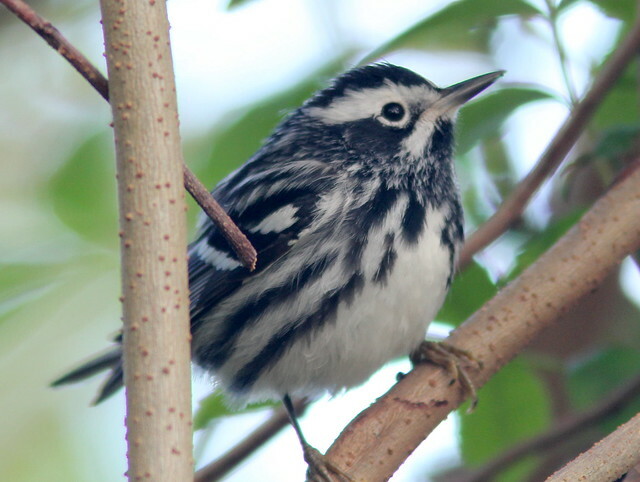 They are also extending their breeding range northward into Georgia and South Carolina. 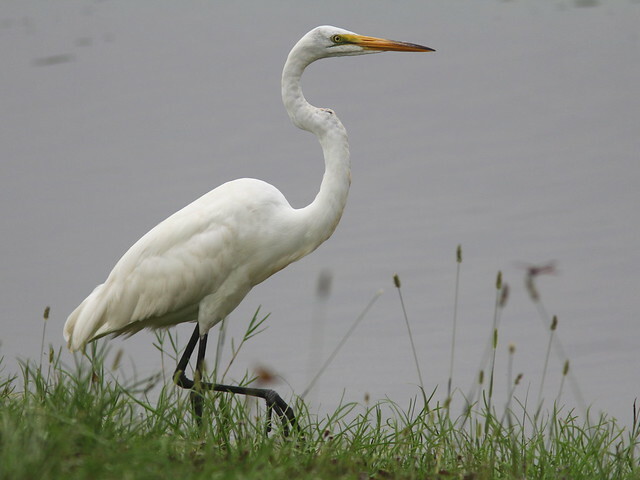 The stork extended its wing to provide a shady spot where small fish might congregate and blunder into its open jaws. 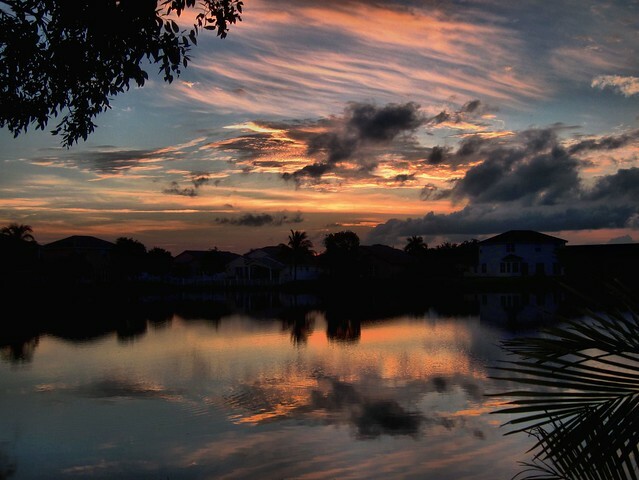 We were free of chores one morning when the rain held off.We watched the sunrise from our back patio. We got a late start, and were surprised to find a group of deer that included at least two bucks and two does. They were only about 5-6 houses up the gravel road that leads into the wetlands. A neighbor saw an additional two spotted fawns. 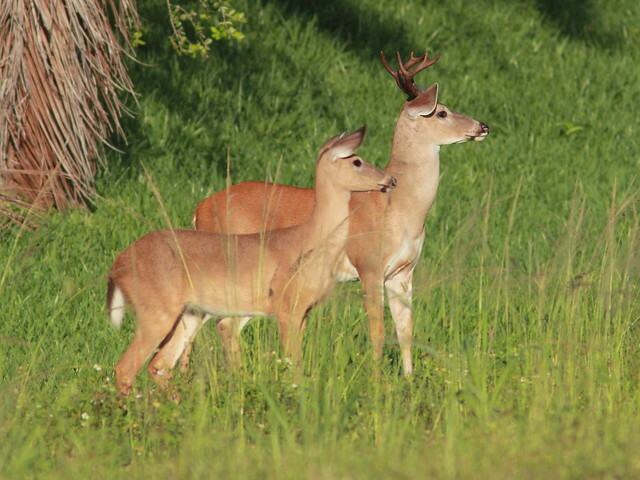 The buck is usually more secretive. 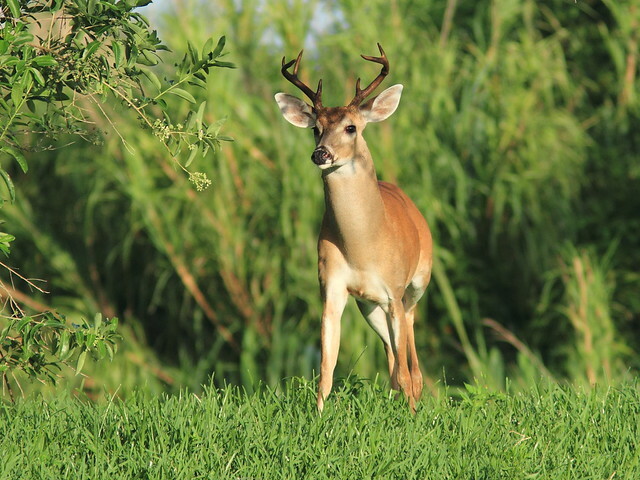 It is an 8-pointer, still in velvet. One of the couples struck a nice pose. We visited the local heron rookery after an absence of over six weeks. 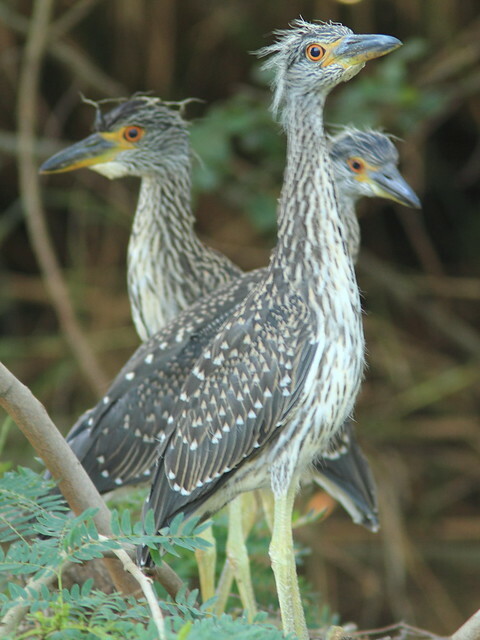 I had hoped to compare nesting success of herons which nested in the defoliated trees that were treated with herbicide against those with nests in untreated trees. 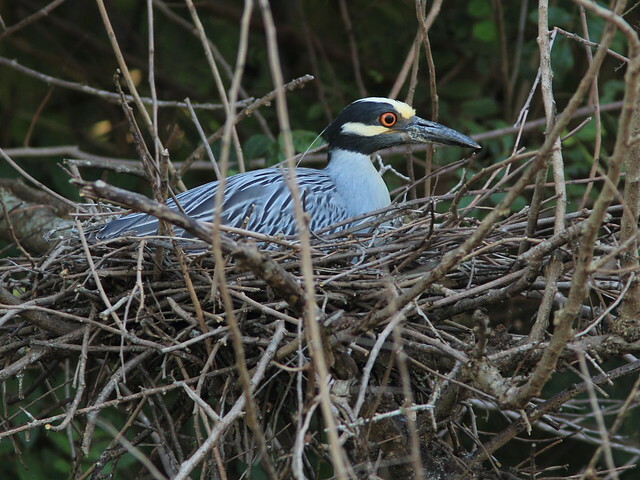 The lack of observations while we were away greatly limits any conclusions that might be drawn, but Yellow-crowned Night-Heron Nest #9 (herbicide treated) had hatched out at least 2 chicks that I last photographed on April 22. My neighbor Scott said he did subsequently see fledglings near that nest. Interestingly, after Nest #9.5, which was located rather high in an adjacent non-treated tree, fell apart in a windstorm, that pair apparently took over the vacant nest #9. Today there was an adult incubating on Nest #9. The three chicks in #10 non-HT, the next nest to the south, were all in the nest. 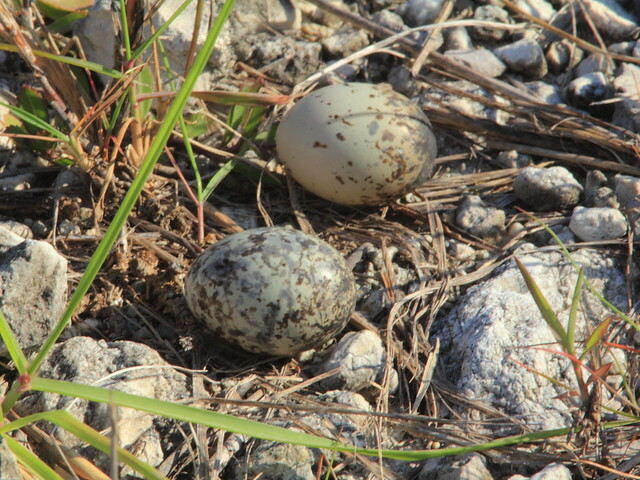 This is my photo of the same nest taken back on on April 18, about three days before the eggs hatched. 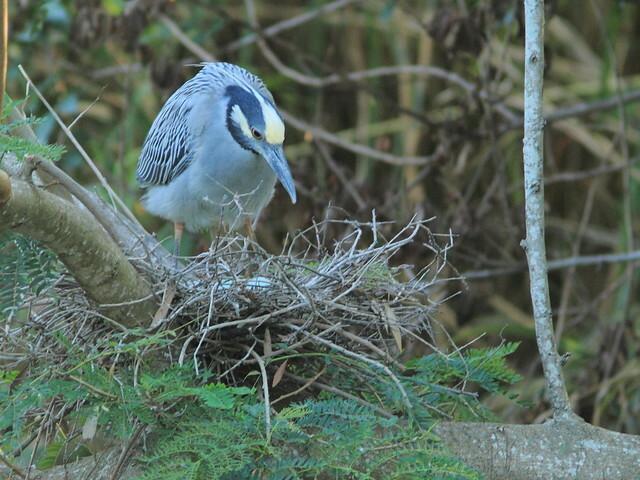 This is the heron now incubating on Nest #9, an herbicide-treated tree. 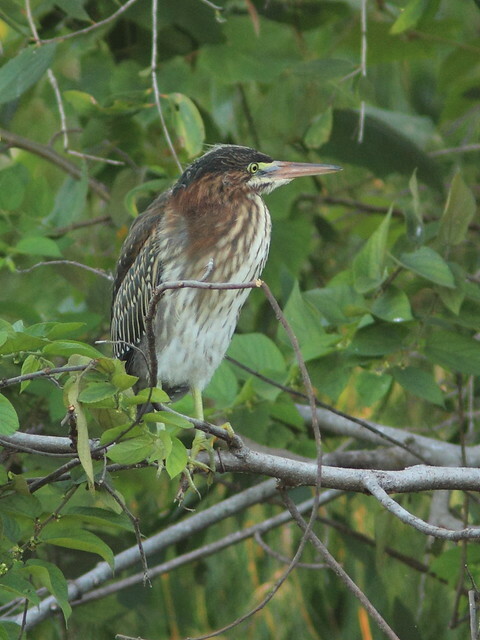 Two Green Heron nests, one in an herbicide-treated and the other in a non-treated tree, were both successful in fledging young. 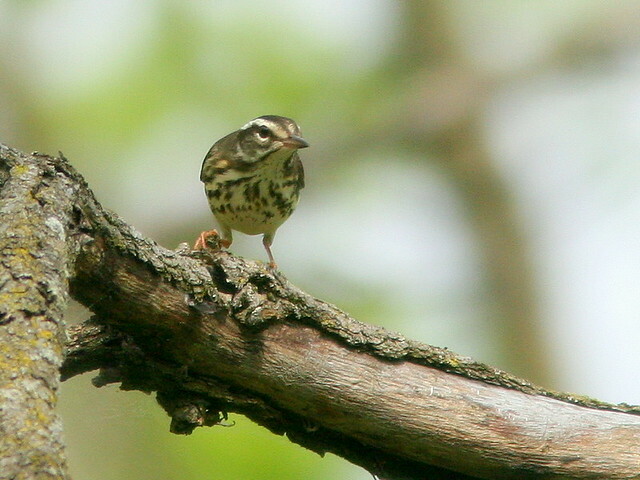 This is one of the fledglings from the non-treated tree. 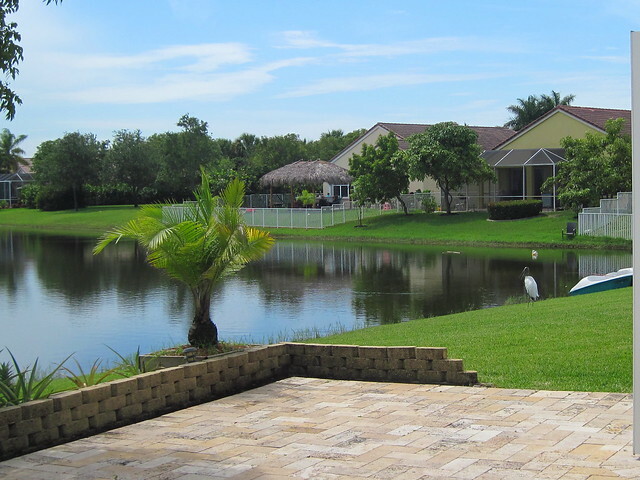 We are “reverse snowbirds,” permanent Florida residents who follow the birds north to our Illinois condo in the spring. We reverse the process and return to catch up with them in the fall as they stream back across Florida. 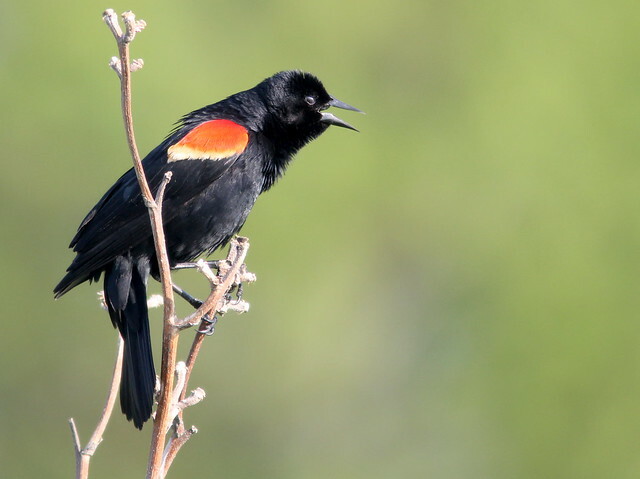 This spring was particularly unproductive near our home in interior southeast Florida, as strong easterly wind flow across the peninsula caused neotropical migrants northbound from Cuba to follow the west coast or fly directly across the Gulf of Mexico. 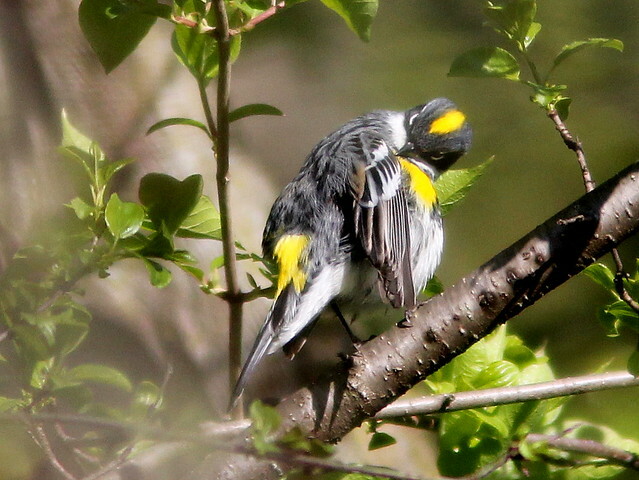 However, when we arrived in Illinois in early May, we were greeted with cold and rainy weather for the first two weeks of our stay, and again were disappointed at a poor turnout of warblers. By the end of the month, the weather turned sunny, windy and hotter than back home in Florida. The vagaries of Chicagoland weather reminded me that just the opposite happened late last May, nearly at the end our stay in Illinois, when I was pretty much side-lined. The weather had taken a nasty turn, with cold rain and light frost two mornings the previous week. On top of that I came down with a nasty sinus infection that turned into bronchitis and wheezes. 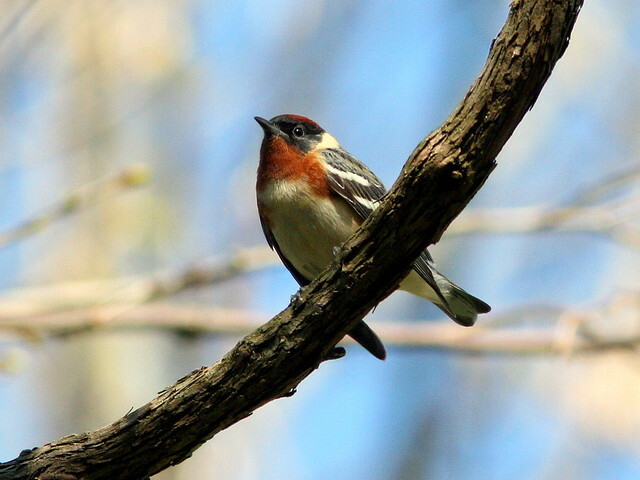 Waiting for the antibiotics and inhalers to kick in gave me time to reflect upon a recent good birding experience. 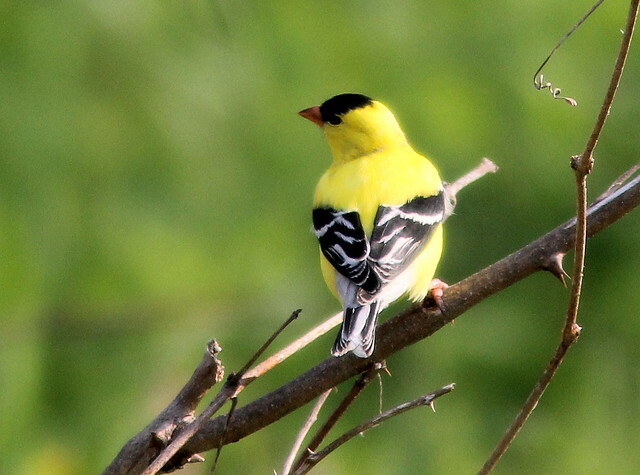 I can credit Mary Lou for finding the best bird of last spring’s Illinois visit, her 506th North American life bird. We were walking in the Aurora West Forest Preserve in Kane County, when we heard some loud cackling and squawking noises that persisted for about 10 seconds. 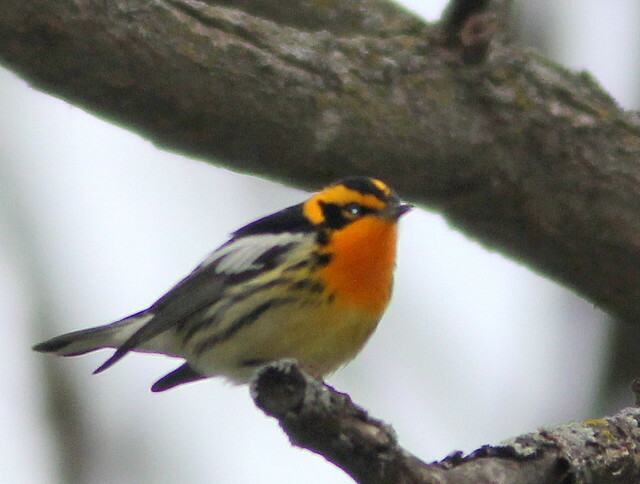 They seemed to be from a bird, but were like nothing I had ever heard before. The nearest I could imagine would be a chicken-like species, but did not think that bobwhites or pheasants ever made sounds like that. Then, she spied a fairly large bird low in a tree right next to the trail. 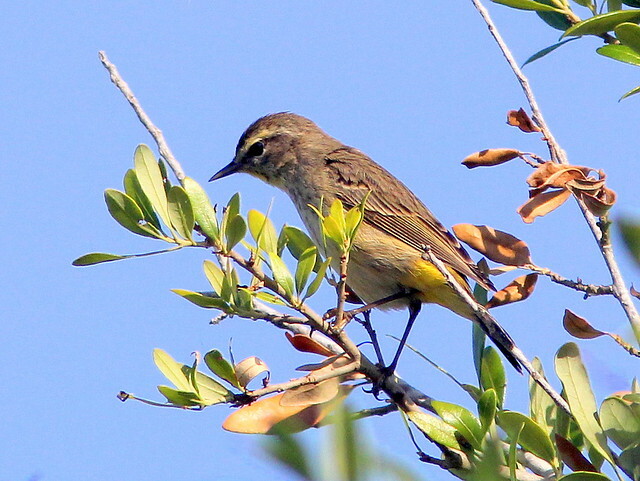 As it was partially hidden among the leaves, I almost dismissed it as a thrasher or a grackle. 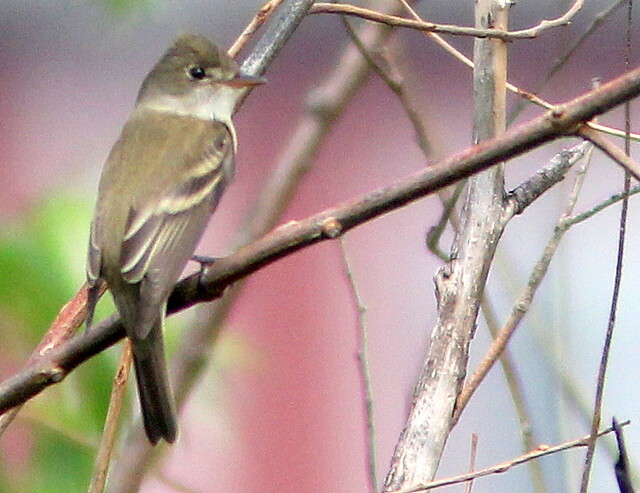 It flew a few yards to another tree and we noted its white undersides, plain brown back, and drooping tail. 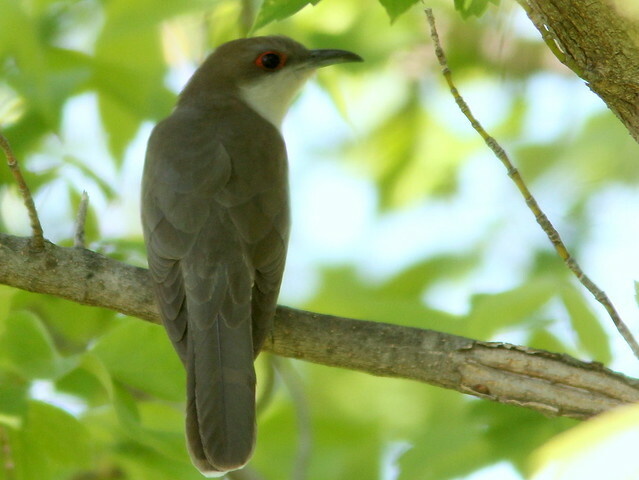 It lacked rufous in its wings, which are characteristic of the more common Yellow-billed Cuckoo. 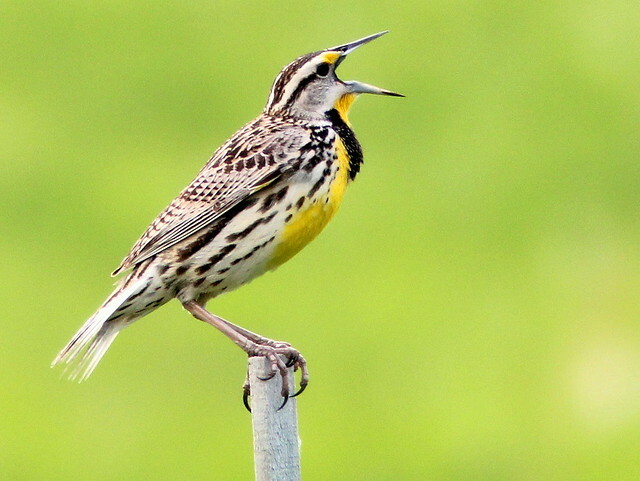 I felt well enough to celebrate International Migratory Bird Day the next weekend by helping staff the Kane County Audubon Society booth at the Bird Fest. In anticipation of leading a bird walk, Mary Lou and I scouted out the planned route, located at Peck Farm Park in Geneva, Illinois. 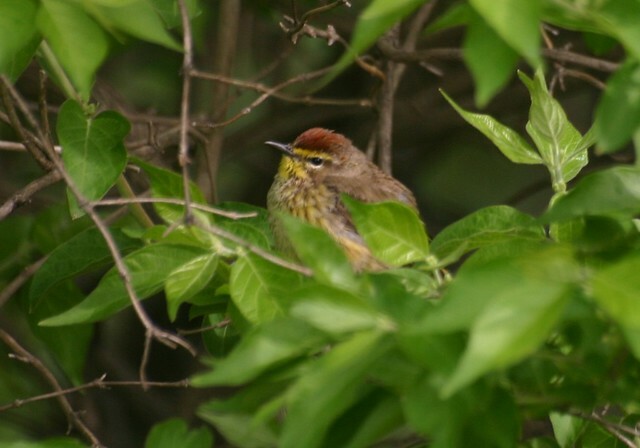 On a sunny and warm morning, two days before the Fest, we found lots of birds, some of which were seen up close and personal– just the kind of views that we hoped would enthrall the anticipated (mostly young) participants. For my forthcoming walk, I planned to provide my interpretation of the reason why the bluebird houses were placed back-to-back. 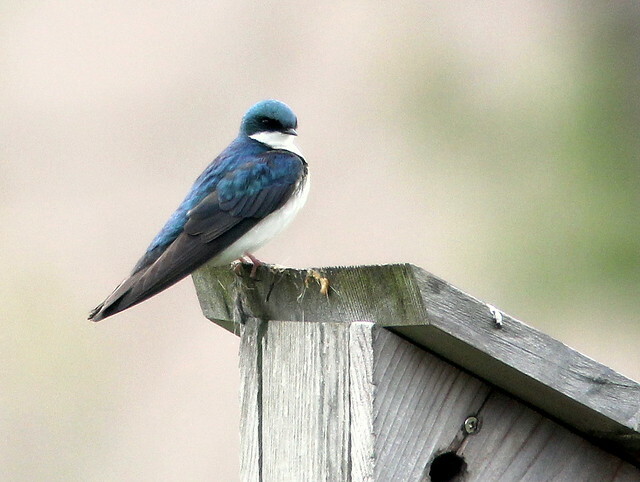 Tree Swallows aggressively defend their nesting territory against all other bird species, but especially other Tree Swallows. 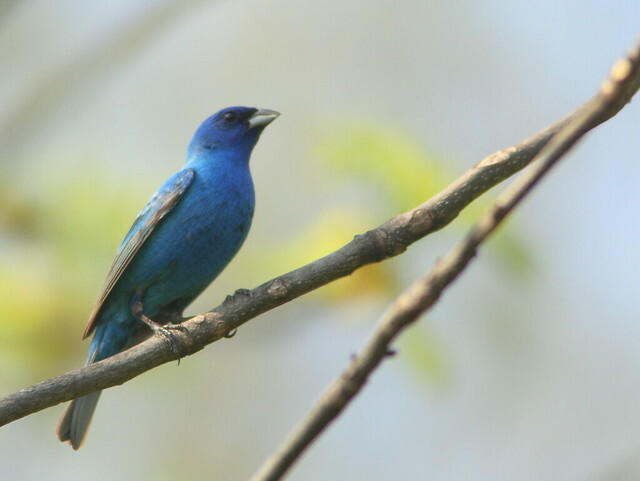 It has been shown that pairing of bluebird houses, either back-to-back or only a few feet apart, and then leaving a space of some 100 yards before erecting another pair of boxes, may provide bluebirds a better chance at nesting in one of the paired boxes. 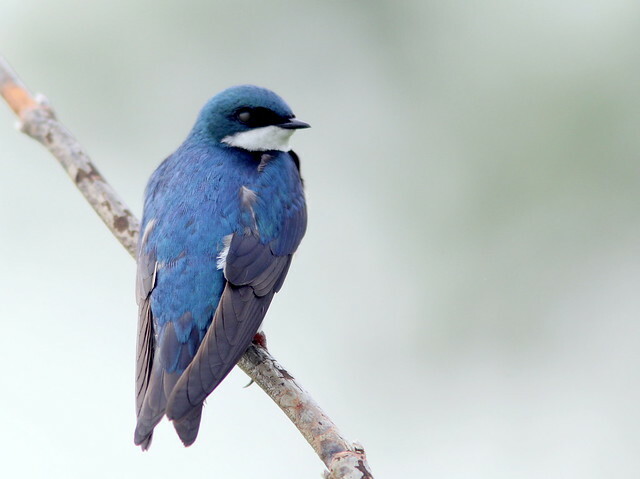 It seems that the Tree Swallows are more tolerant of other species if they are able to successfully defend their territories against other Tree Swallows, and perhaps the two species assist each other in this defense. 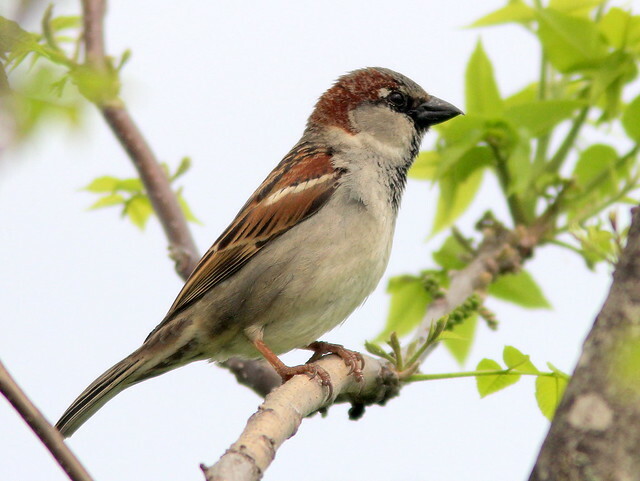 House Sparrows can disturb this plan, as they claim the boxes earlier in the spring, and usually are able to evict bluebirds. 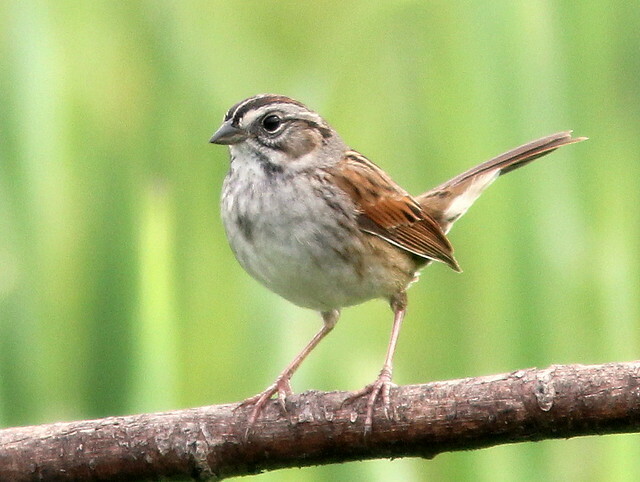 The sparrows should generally be removed if they begin to colonize the bird houses, as they can eventually displace all other species. 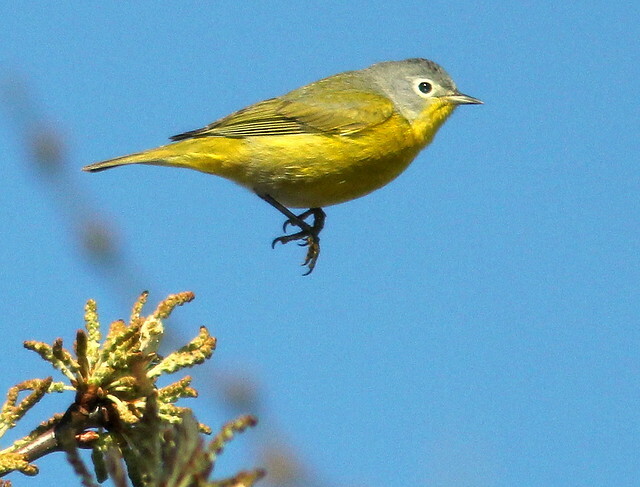 We had seen 32 bird species in the course of an hour, and I looked forward to the Bird Fest, only two days away. Unfortunately, a strong cold front rolled in the next day, and temperatures dropped from near 80 degrees into the 40s that afternoon. It rained during the night, and in the morning we set up our booth on the porch of the Peck Farm Park interpretive center, fighting high winds from the north and a wind chill in the low 30s that kept the crowds away. 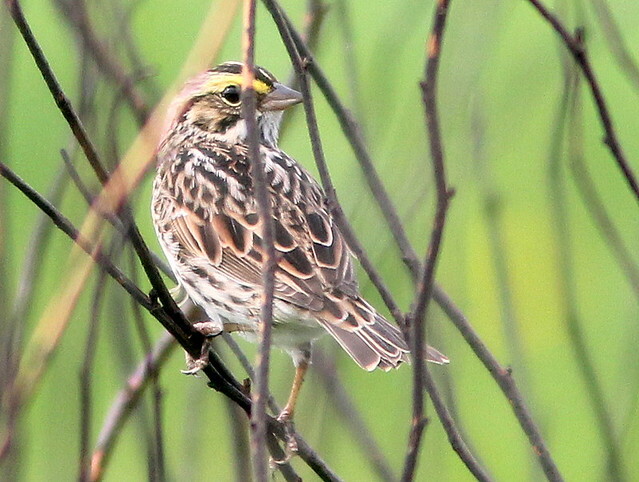 I led the 10:30 AM bird walk for five hardy participants. One was a little girl who wore a flimsy fleece jacket but who participated enthusiastically. After 15 minutes the others gave up, yet she and her father kept with me as we tallied a paltry count of 13 species over a half hour. By then I was miserable with chills and fever, but her spirit was heartwarming!